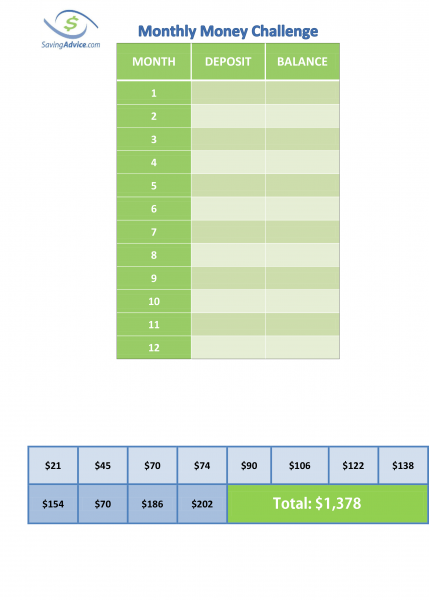 I’ve had a few people request a monthly chart that uses the 52 week money challenge numbers. I’ve been hesitant to make this one because my initial thought was that it was so far removed from the 52 week money challenge that it doesn’t even look much like it anymore. The more I thought about it, however, the more it became apparent that if you’re only paid once a month, probably the best way to save that money is to immediately pay yourself first, rather than each week. I finally realized that if this version helps even one person follow through and create an emergency fund, then it’s worth creating. It’s not exactly pretty, but it works. This standard version runs into the issue that it’s heavy on saving money at the end of the year when money may be tightest due to the holidays. It therefore made sense to create an alternate version for this as well. This allows you to choose which of the twelve amounts to deposit each month depending on how your finances are doing that month. Once you input that amount, you cross off the box at the bottom. It simply gives you a bit more flexibility, which will hopefully allow you a better chance to complete the challenge. The problem is that even though this alternate version gives more flexibility than the standard monthly chart, it has a lot less flexibility than the original challenge, as there are only 12 choices rather than 52. 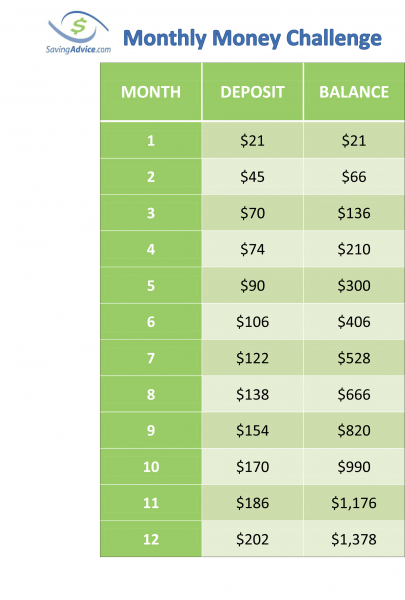 While this is certainly one option to try to do the challenge, it seems to me to make more sense to shoot for saving $1200 by saving $100 each month, $1500 by saving $125 a month, or $1800 by $150 each month, etc. You could even do it with a smaller amount, and then increase that amount as the months go by and you become more confident in your ability to save. What this monthly version does do is give you another option to consider while searching for which challenge ultimately best fits with your personality. It also has the distinct advantage that when you get paid your monthly check, it makes it fairly easy to save this amount right then and there before all the money gets spent on other things. If you’re disciplined enough to make sure that you pay yourself first when your paycheck arrives, you should succeed at completing the challenge, and that’s really the key to this game. To wrap this up, there has been massive growth in applications designed to help Joe and Jane average hack their savings. One great new piece of software out there is digit.co. How digit works is that it analyzes your savings account and then makes small withdrawals automatically. The withdrawals are geared so that you won’t bounce any checks and the funds are auto swept into separate savings account for you. 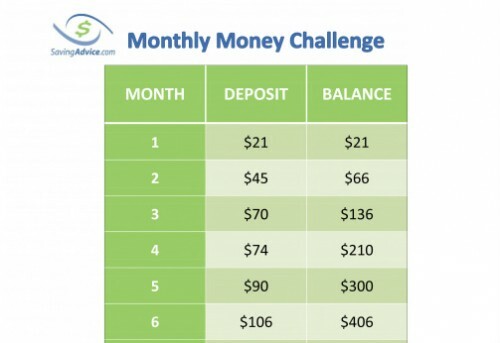 Its a great way to start implementing effortless forced savings into your challenge plans. All you have to do is sign up. Once the software is activated Digit does all the work for you – you just need to check your account balances. Go here to check out digit.co.